A fascinating new report sheds light on the changing sites of cancer treatment: Cost Drivers of Cancer Care: A Retrospective Analysis of Medicare and Commercially Insured Population Claim Data 2004-2014 (free download). It was commissioned by the Community Oncology Alliance (COA) and conducted by researchers at Milliman, an actuarial firm. The report, which includes both Medicare and commercial claims data, confirms that the administration of chemotherapy infusion has shifted dramatically from lower-cost physician offices to higher-cost hospital outpatient settings. From 2004 to 2014, the buy-and-bill market share at physician offices dropped from about 90% to about 50%. See the chart below. Commercial payers’ reimbursement approaches, combined with the 340B Drug Pricing Program, will continue to shrink buy-and-bill volume in physician offices. Unfortunately, these same factors also suggest that the Centers for Medicare & Medicaid Services (CMS) crazy Medicare Part B experiment will accelerate the shift of drug administration to hospital outpatient facilities. 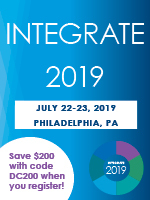 The Milliman study relies on claims data from (1) a limited data set containing all Medicare-paid claims generated by a sample of Medicare beneficiaries, and (2) the Truven Health Analytics MarketScan Commercial Claims Database. (See pages 26 to 39 of the report for the methodology.) It’s a solid piece of analysis. 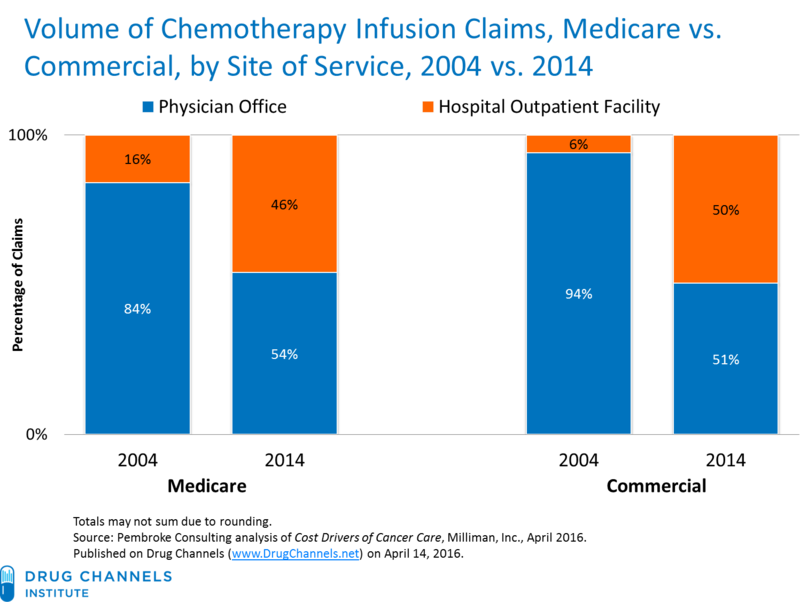 The chart below summarizes the volume of chemotherapy infusion claims for both Medicare and commercial payers. As you can see, the share of chemotherapy infusions delivered in physician offices dropped from 84% to 54% in the Medicare population and 94% to 51% in the commercial population. 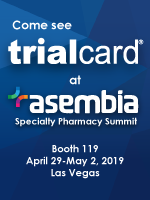 These changes have crucial implications for pharmaceutical manufacturers’ channel strategies and for the specialty drug distributors that sell to physician offices. Hospitals’ superior profits insulate them from the controversial Medicare Part B Payment Model proposed by the Centers for Medicare & Medicaid Services (CMS). See my description in Why CMS’s Crazy Plan to Remake Medicare Part B Won’t Work. "Physician offices could be crushed, which will accelerate physician consolidation into health systems—and likely raise healthcare costs as the mega system extracts more from payers," Adam Fein, president of Pembroke Consulting said in an e-mail. Five years ago, I predicted that buy-and-bill would continue to lose share due to the many forces of change aligned against the practice. (See June 2011’s The Future of Buy-and-Bill According to Payers and Oncology Practices.) At the time, I focused on specialty pharmacy fulfillment to healthcare providers, a.k.a., “white bagging.” Providers pushed back against payers and successfully slowed the growth of white bagging, partly to protect their drug administration profits. Now, CMS looks set to finish the job and further shrink buy-and-bill in physician offices. Can anybody tell me what's wrong with this picture? Buzzfeed is Buying Drug Channels!